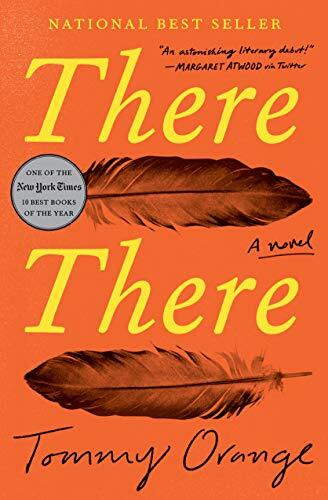 Tommy Orange’s debut novel, There There, does that and more. Like Wilder’s own The Bridge of San Luis Rey, There There relates the overlapping stories of characters whose fates slowly converge. Several Native American residents of Oakland, California, are preparing to attend a large national powwow at the Oakland Coliseum. They are young and old, male and female, and each has a separate reason for being there. Dene Oxendene, a student, is going to film Native people at the powwow telling their personal stories. Edwin Black, whose mother is white and whose Native father disappeared before he was born, is trying to connect by helping with the powwow’s raffle. He is helping Blue, who left an abusive husband in Oklahoma. Thomas Frank, who is fighting a drinking problem, will play drums. Orvil Red Feather, whose mother died of an overdose, will dance publicly in full feathered and beaded regalia for the first time, having learned to dance from YouTube. He lives with his great aunt Opal, who will come to watch. Others come to watch as well. Three of them are planning a crime. Orange himself is from Oakland. And he is also a Native American. So this is personal. Orange is writing about his city and his people. His question is direct: What does it mean to be a Native American in the present day, especially in the city, “the final, necessary step in our assimilation”? So how is Orange supposed to be true to himself both as an Indigenous person and as a modern writer? It soon becomes apparent that Orange has abundant literary gifts and that these have enabled him to create a unique and powerful statement. The rather overtly clever choice of the title is deliberately evocative of another Oakland native, Gertrude Stein, who once famously described their hometown as having “no there there.” The quote is commonly held to be a put-down of Oakland, but what she actually meant was that, upon returning to Oakland as an adult, there was no trace of the Oakland she had grown up in. Her old house had been torn down, farmland dug up and developed into housing plots—everything had changed. The “there” of her youth was simply gone. But Orange also has a character riding the subway while listening on his phone to another “There There,” this a song by the British pop group Radiohead. The song’s lyrics are quoted in part: “Just ’cause you feel it doesn’t mean it’s there.” The title thus is referring both to a place, a home that has vanished, and a sense that something of it remains. At first glance, Orange’s characters are clearly struggling with issues common to any urban setting: drugs, alcohol, displacement, physical abuse, divorce, unwanted pregnancy and abortion, poverty, early death. The dialogue is filed with the slangy, hip-hoppy language of the street that you would hear anywhere in the inner city. Character by character, Orange details the pain of having an absent parent, being poor, of having no direction in life, of feeling alone, disconnected, and useless. Hovering over their lives, however, is an awareness, often remote, that they possess a heritage, practices that have been handed down over the years by elders and grandparents, Native traditions that might somehow be an anchor for them in the present if they can find a path to let them. There There is the story of the different attempts of a handful of Indigenous people to reconnect with this heritage both in their own individual way, but also as part of something bigger than themselves. Orange’s impressive originality comes through in a number of small ways. Two are striking. First, he occasionally appears to leave things out. For instance, a character relates casually that his brother and uncle had “stolen some plants from someone’s basement.” That’s it. Later it’s clear the plants were marijuana. The characters didn’t need an explanation, so none is provided. Context, though, makes things understood. The other, wonderfully effective device Orange uses is to be deliberately vague about time and dates, frequently jumping backward or forward in time with neither warning nor explanation. What he is doing is reflecting a trait of many Native languages: using relative time instead of absolute time. It is again context, not chronological order, that brings understanding. Using relative time is a nod to the different rhythms of Indigenous language and culture and works to bring out the emotion and spirit of the narrative more acutely than if it were chained to a strict timeline. The result is that the personal journeys in this novel move to rhythms both ancient and modern in a brilliant, multilayered portrait of the search for identity and belonging.